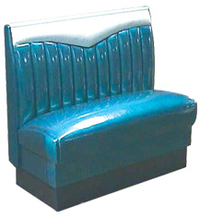 Furniture - Diner Booths - Cambridge Nostalgia & Co. - Retro Furniture, Gas Pumps, Games & More! 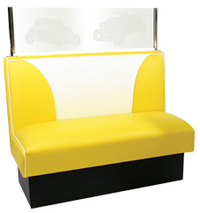 A fully upholstered booth featuring a smooth inside back with classic high base design. 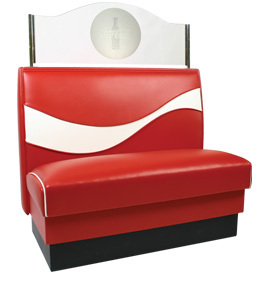 Single - 24"D x 44W"
1/4 Circle - 44" x 44"
1/2 Circle - 44" x 84" x 44"
3/4 Circle - 44"x 84" x 84" x 44"
A fully upholstered booth of classic design. Your choice of base - high enclosed base or optional high pedestal design. No charge for contrasting "V" and welt in same grade. 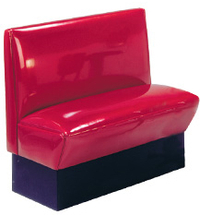 Standard from represents a fully upholstered booth featuring a"V" shape Headroll with 11 vertical channels at 4" centers. 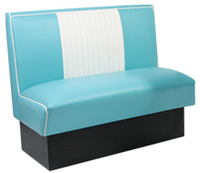 3/4 Circle - 44"x 84"x 84" x 44"
Constructed fully upholstered, featuring a tufted back insert. 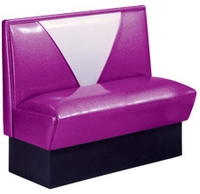 A fully upholstered booth featuring vertical channel tufting on 7" centers. We are constantly updating our website to bring you the latest products we carry. Please check back often, call us (519.740.6367) or email us at: info@nostalgiaco.com if we can answer any of your questions.